What is Graphic Recording? What is Graphic Facilitation? What is Visual Practitioning? What is Live Scribing? Are they all the same thing? There are commonalities among all these terms. I call myself a Graphic Facilitator because I normally provide input into how my services will be best incorporated into the meeting design. In general, I do not reproduce people’s words verbatim – I capture the essence, the flow, and provide connections between key points even if they are not explicit in a presentation. What do I need to provide as a client? Please provide an agenda or outline of the meeting; desired outcomes; the name and contact information for the meeting facilitator. I bring my own materials and boards/easel if adequate wall space is not available. I do require contact with the facilitator to make sure we are on the same page, and have a clear understanding of our respective roles. My job is to help the facilitator run a successful meeting. How soon do I need to contact you? It is best to contact me at least three weeks before the event in order to avoid scheduling conflicts. Do we need to meet in person before the event? We definitely need to communicate on some level. In person is usually preferable, but over the phone is also adequate. Email can leave too much out so I’d prefer it not be the only way we communicate before an event. I will also need to be in touch with the facilitator if that will be someone other than the meeting organizer. What happens to the charts following the meeting? All charts become the property of the client following the meeting. If desired, I take high-resolution digital photographs of each chart and provide those to the client within five days of the meeting (usually within two). I encourage clients to make the charts part of the organization's collective memory. There are lots of ways to do that, and we can discuss which ones might be best for you. 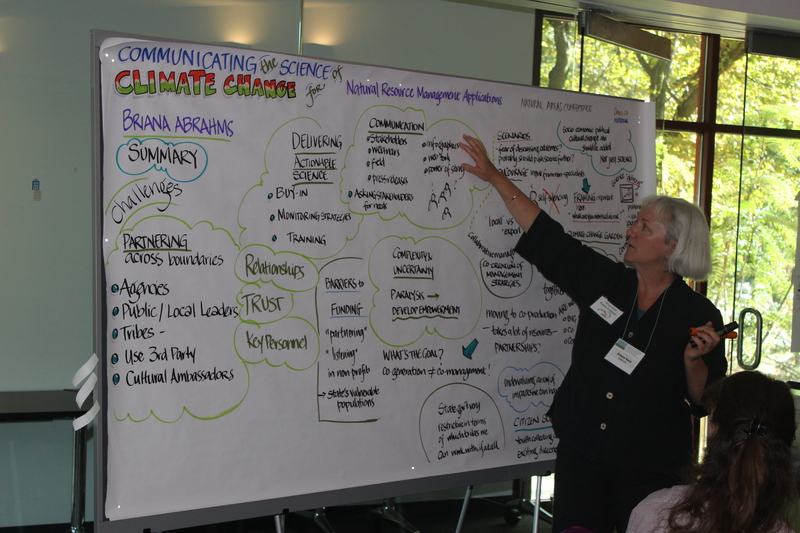 Alison uses the chart to summarize a conversation back to the group. Won’t you be a distraction to meeting participants? 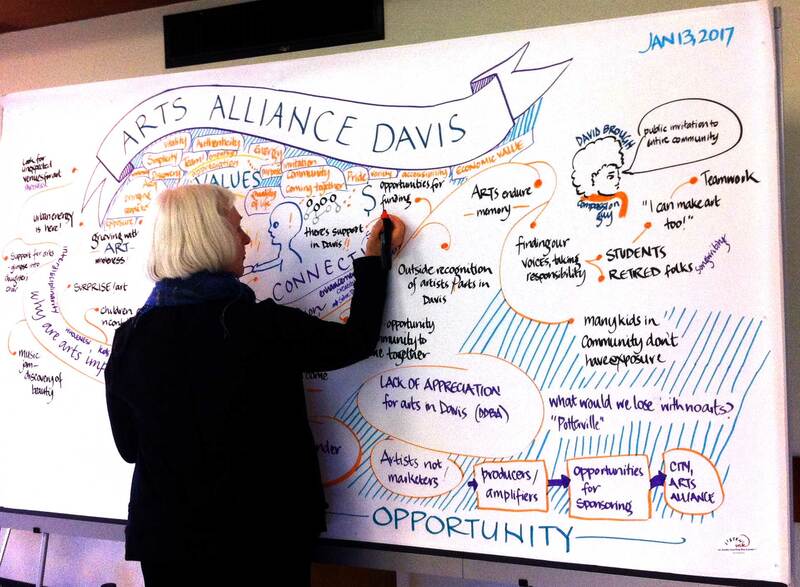 Graphic facilitation can be a tremendous aid to understanding. People have different learning styles and providing the same information in different ways maximizes the reach of what is being said. It’s inclusive and lively. I do draw quietly to one side of the main presentation – not in front of everyone – so my work can be seen but not dominate the meeting. Is there any way to change charts once they’ve been completed? Yes. I always encourage meeting organizers and participants to look at the charts following the meeting to make sure I captured, in essence, what was said. Minor additions or corrections can almost always be made on the spot. If more extensive changes need to be made or a chart needs to be redrawn entirely, additional fees may be incurred. Is there a penalty for rescheduling or cancelling a meeting? There will be no fee charged if a cancellation is made 16 days before the event. If you decide to reschedule within 15 days of the meeting, no cancellation fee will be charged. However, if the meeting is cancelled within 15 days without intent to reschedule, you will be charged 50% of the agreed-upon fee, plus any non-refundable expense.